This entry was posted on February 22, 2011 by Sean Gallo. It was filed under cartoon, drawing, illustration and was tagged with art, bite, drawing, elephant, how to eat an elephant, illustration. Is this image free to post on Facebook? I posted it to my Facebook page. Thank you for giving me permission! Have Happy New Year! Hi Carol – no problem. Thanks for reaching out and asking for permission. I’d like to use your graphic (how to eat an elephant) in a presentation. My talk includes the topic of incremental change and how an organization needs to be OK with steady, slow progress towards the goal. Would that be OK? Hi Sean – I love your cartoon! I work as a HR person inside a large government (not for profit) agency. I’m leading a change project for about 200 people who really need alot of support through a tough time – I’m doing a round of talks over the next few weeks and would like a little levity – and creativity – to open. Am very happy to acknowledge you as you’ve requested above. May I use your cartoon please? Hi Fleur – thanks for the kind words. I think that should be fine. If my cartoon can help you to pull some people through a hard time, I’d be glad. If you end up using the cartoon online, please provide a link back to my site (ideally, the cartoon itself will be linked back to my site, so if anyone clicks on it, they come here) and if it’s possible, I’d love to see where/how you incorporate my cartoon. If it’s a presentation, and you can share it with me… or if it’s online and you can give me a link? Hi Sean. I am an L&D professional working within a company. Would I please be able to use your image in a presentation for our team leader development programme to illustrate the principles of continuous improvement? Hi Greg – thanks for your interest in my work, and for contacting me asking for permission to use it. Yes – I’m fine with you using my How to Eat an Elephant cartoon in your internal presentation. Please just do not modify the image, and provide a brief attribution including my website address http://www.seangallo.com. If the presentation should happen to be made available online, please provide a link to the original posting of the image on my site. And please ensure that nobody reuses the image for any other purpose without securing my permission. Thanks – and good luck with your presentation! Hi Sean. Brilliant cartoon. Well done. I’ve read all your replies to others, so thought I’d contact you for your decision. I have a website membership program for trade contractors – teaching them how to give better customer service. We have a lot of stuff for them to do, and your cartoon perfectly illustrates what we’re trying to say to them – don’t be overwhelmed with it all, take it one step at a time. Are you happy for me to use your cartoon if I attribute it to you and link back to your site? Hi Annette – thanks for the kind words, and for your interest. Hi Sean, not sure if the comment I just posted made it to you or not, so I’m trying again. I love your elephant graphic – it’s just gorgeous.. I’ve read your other comments and replies and would like to gain your permission also. I’m building a website for our new business which teaches tradies (trade contractors – plumbers, builders, electricians, etc) to give better customer service. I’d love to incorporate this graphic as we give them so much training and action lists that they may feel overwhelmed. Of course I’ll attribute the design and permission to you and incorporate a link to your site. What do you think? 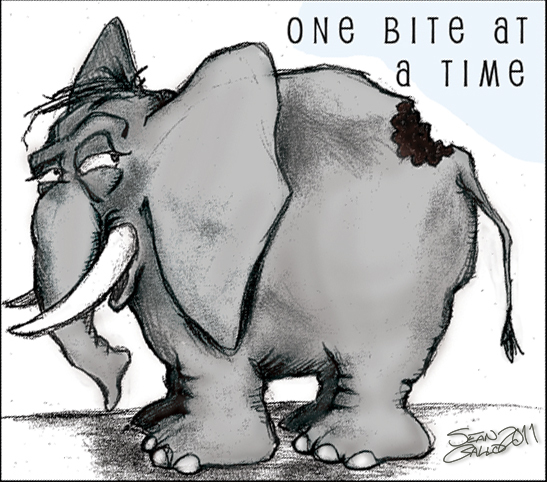 Hi Don – sorry for the delayed reply, but yes you may use my How to Eat an Elephant illustration for your site. If possible, I’d love to see the context in which it’s being used… if you can’t provide me access directly to the page, maybe you could send me a screenshot? Sean – We have an opinion piece in our magazine and we wondered if we could use the image with the story. Is there any way we could use it with the story? We are happy to attribute it to you and link back to you in our publication and on our website. Please let me know ASAP. Hi Jan – can you tell me more about your magazine and website? I’d also be interested in knowing the subject of the opinion piece to which you want to attach the illustration. Please let me know. Hi Jensen – thanks for your interest in my work! I prefer that you share it as a link on your FaceBook page… just copy the address of this page and paste it into your FaceBook status field along with any comment you want to add, and that will be fine with me! Sean, I’d like to use your graphic (how to eat an elephant) in a presentation. My talk includes a section on incremental change and how an organization needs to be OK with slow progress towards a goal. This slidedeck will likely be posted on the web after the conference and I will include a link to your website. Would that be OK? Not sure if my other reply was lost. Sorry if this is a duplicate. I’m developing a class in Beginning Genealogy. This is an IRL (in real life) class. I would like to use your illustration to help introduce my section on the genealogy research process. Appropriate attribution will be made on the slides – which will not be made public. Hi Sarah – thanks for your interest in my work. I’d love it if you could tell me a little more about your class. Are you affiliated with a school? Sean, I am the Healthcare Coalition Coordinator for my state. I’m giving a briefing to the coalitions around the state to discuss what appears to be an insurmountable project. I’d like your permission to use your illustration as my wrap up slide. Hi Sean, may I use your elephant picture in a blog post I’m writing? I am using that proverb to talk about my journey as a doctoral student, and your drawing is perfect. I would link to your site when crediting the image. Thanks! Hi Jen – thanks for your interest in my artwork, and thanks for reaching out to request permission. Yes, I am fine with you using my How to Eat an Elephant illustration in your blog post with link and attribution. I prefer that you link to the image on my site, rather than saving it and uploading to your site. Best of luck on your doctorate! Hi Sean, Great website! I am a grad student (Uni of San Fran) and I am working with a non-profit org on service learning school project. Can I pls use your pic “how do you eat an elephant?” in a preso please? It will be fully attributed & include a link to your website. Hi Gosia – thanks for your interest in my work, and thanks for reaching out to request permission to use it. Your use of my How Do You Eat an Elephant illustration in your presentation, with attribution and link to my site, sounds fine. If your presentation is made available online, please send me a link – I enjoy seeing where my artwork is used. Good luck with your presentation and your non-profit project! I’d like to use this on my blog for an article I just wrote. I linked it back to this page. Please let me know if I need to remove it, or what the payment terms are. http://assimilationsystems.com/2015/07/14/eating-security-compliance-elephant/ It’s an awesome illustration! I love your image! I texted it as motivation to a girl I supervise. She’s leaving for a new job soon, would you mind if I printed and framed it for her new office? Hi – thanks for the kind words, and thanks for asking for permission to use my drawing! I’m happy to give you permission to print and frame a copy for your coworker. I hope she enjoys it! Hi Sean – This is an amazing drawing! I am giving a presentation at a conference on learning (I am not selling anything at the conference just speaking about learning and development). May I have permission to use your one elephant at a time image? I will of course attribute the drawing to you citing the illustration is by you and providing your website, seangallo.com). Hi, Chris – thanks for the kind words and for your interest in my artwork. I’m happy to grant permission for you to use my How to Eat an Elephant drawing in your presentation. Could you tell me a little more about the conference? I’ve worked in eLearning for most of my professional career, so I’m curious. Hi Sean – I’m speaking at one of the breakout sessions at the 2017 Dev Learn conference. My presentation is about microlearning. Oh, very cool, Chris… and I totally get how “One bite at a time” works with the subject of microlearning… on multiple levels if you think about it. Good luck with your presentation, and have fun in Vegas!